Yay, it's March! That means it's time to creating Easter cards and goodies. I love this time of year. It's also time for the Papertrey Senior Design Team Challenge. 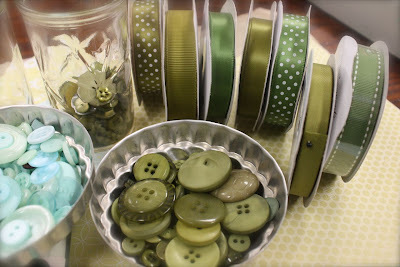 Nichole asked the designers to create a fresh and fun Spring time project. 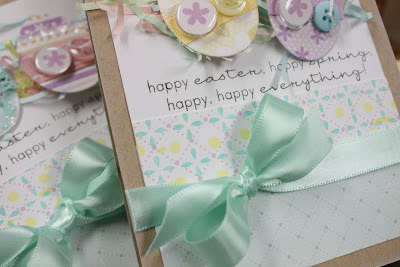 I chose to create some dimensional Easter cards using products from last month's release and goodies from my Spring/Easter Inspiration Station. There's a lot of fun details on my cards so be sure to zoom in for close up shots. 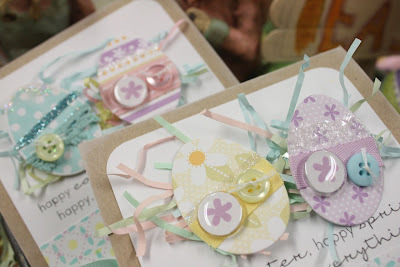 I created these egg doodads some time ago using papers from the Egg Hunt patterned paper collection, the egg die, tied Vintage Buttons, punched circles with clear, epoxy circles on top, glitter, and ribbon. It's so fun to just die cut a bunch of eggs and then add little embellishments to fancy them up. It's just as much fun as coloring real eggs! 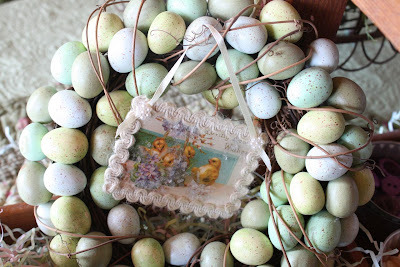 I nestled the egg doodads in some pastel Easter grass, using my tape runner to adhere the grass to my card front and pop dots to adhere the eggs to the grass. For the bottom of my card, I used the cutest sentiment ever from Pine's Egg Hunt set. I then created some fun patterned paper using various ink colors and Pine's Tin Type background set. Zoom in to check it out further. A piece of patterned paper from Pretty Pastels finishes off the bottom of the card. Card base is Kraft cardstock, inked with Fresh Snow ink. 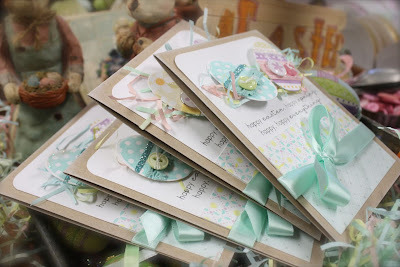 A fluffy Aqua Mist Luxe Satin ribbon finishes off the card. Ahhh, a nice little start to my Easter card stash. I love to see the little piles grow. 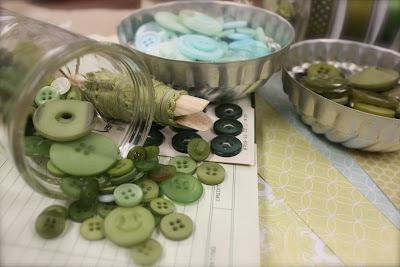 I hope I've inspired you to create some Spring time goodies. Or maybe try your hand at some egg doodads. I'm thinking I need to make a scrapbook page with my doodads lined up along the bottom, tucked into some Easter grass. Wouldn't that be cute?? Hi everyone. With March just around the corner, it's time to get a crackin' on some Spring and Easter projects. Who knows when this winter weather will gone but for me.....it's SPRING!! (please do not remind me that it's not actually Spring because I'm officially forecasting SPRING now no matter what the weather man or calendar says...so there. It's Spring). 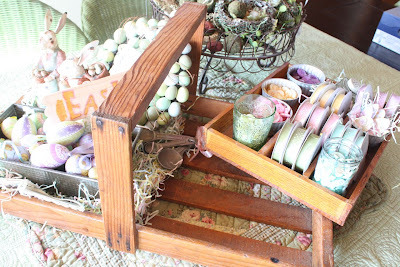 What better way to break in Spring than with my Spring/ Easter Inspiration Station!! This year I've nestled all my goodies into a vintage, wooden basket tray. 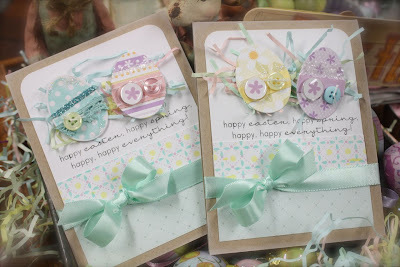 I've included both Easter decorations and paper crafting supplies. 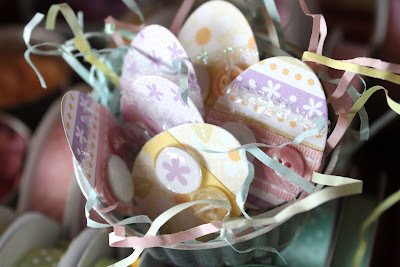 Inspired by Heather's new Egg Hunt collection of stamps, dies and patterned papers, this year it's all about the egg. And flowers. And pretty pastel colors. And glitter. Let the fun begin! Fuzzy, little, yellow chicks are always adorable at Easter time. I love these vintage looking prints. 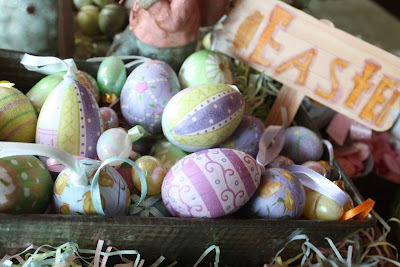 How about these beautiful, pastel, paper eggs? They usually hang on a fake tree but I like them nestled in this old bread pan too. Jordan made that Easter sign out of Popsicle sticks a few years ago. Then there's Peter Cottontail and the little Mrs. They're delivering egg of all kinds. I prefer the Reese's kind. Just sayin'. I got these two vintage looking figurines at Nell Hill's. I do not like green eggs and ham....but I sure like my green egg wreath! Sometimes I hang this, other times I use it as a centerpiece with a candle in the middle. Again, from Nell Hill's. 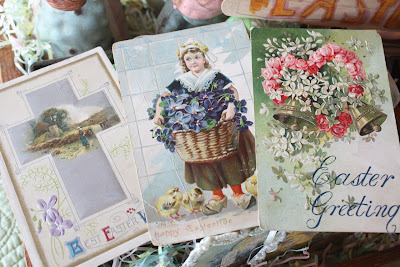 These delicate, vintage Easter postcards were given to me by my dad. They were in a stack full of letters from his grandmother, Cora. I will cherish them forever. And now for the crafting goodies. Using a Papertrey color palette of Spring Moss, Sweet Blush, Lemon Tart and Lavender, I've created a beautiful array of pastel colors. 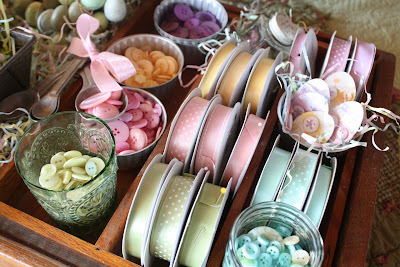 My pretty, assorted ribbons are all lined up. I use stick pins to keep the loose ends tucked in nice and tidy. I've already got a head start on some Easter egg doodads. Stay tuned for a great idea using these egg embellishments very soon. And check out this post of my notepad I made using some of these doodads here..
And look at this. 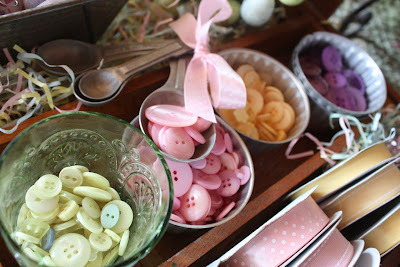 My crafting goodies are nestled into a removable wooden tray. So now when I want to use my goodies, I can just remove that part and take it to my work table. 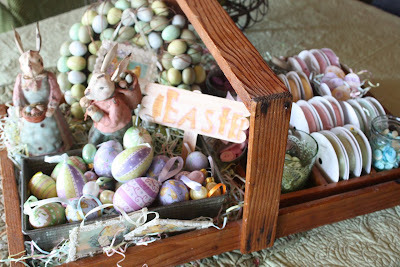 I could see that closer to Easter time, I might use the entire wooden basket as a centerpiece. 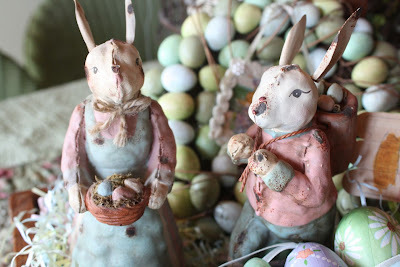 I'll keep the goodies in my stamp room and fill the other side with decorated Easter eggs....or sugar cookies or Reese's Peanut Butter Eggs....oh my, I can't wait. Well. 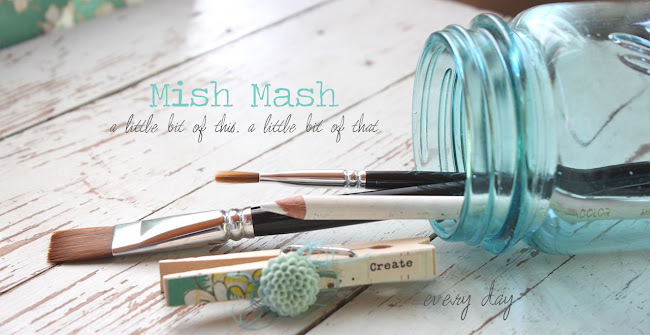 Now that SPRING is here, whatcha gonna create? I can't wait to make more goodies. 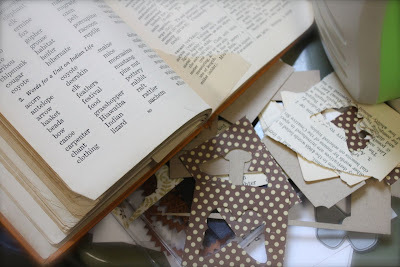 Note: You can look through my Labels section at the left under Easter/Spring and Inspiration Station to see Spring and Easter from past blog posts. Enjoy! 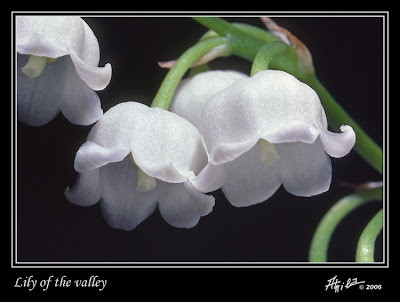 Isn't this a beautiful photo of the Lily of the Valley flower? When you think of lilies, you usually think of the color white, right? Me too. But how do you color white when you've stamped your image on white cardstock? The key is to really look at the shadows. Look at the photo below....there is a lot of pretty, shimmery white color...and lots of gray/purplish color in the shadows. 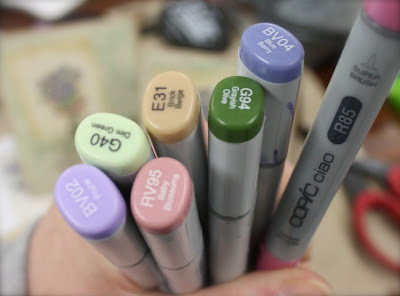 That's what you want to recreate with your Copic colors. 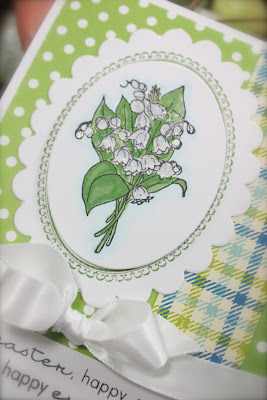 I created my card using the pretty Lily of the Valley stamp from JustRite's Breath of Spring Borders & Centers stamp set and my Copic Sketch markers. For my main image, I left lots of white space on the flower images but also used gray markers to create shadows, keeping my inspiration photo close at hand. If you zoom in on the flowers, you can see that I also added some shimmer to the flowers by using a glitter pen. 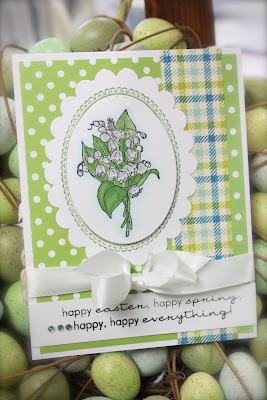 A pretty little card for Easter/Spring...hope you enjoy! Since I've been on this sewing themed kick lately, I just had to pull out one of Karen Lockhart's aprons to work with. 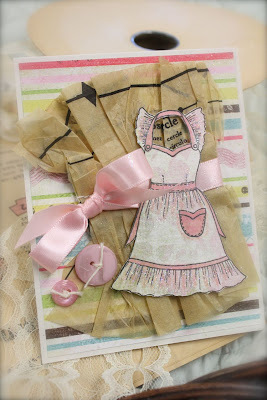 This image is called Vintage Apron. I love paper piecing Karen's apron designs, it's like playing with paper dolls again. I stamped the apron image onto some Fancy Pants patterned paper and colored the trims a little with a pink Copic marker. For the background I scrunched up a piece of old sewing pattern. 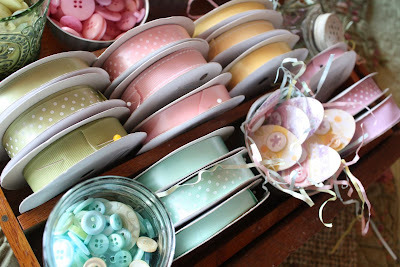 A pretty ribbon and tied pink buttons just add to the feminine sewing theme. 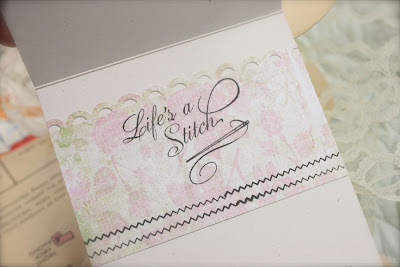 For the inside of my card, I used some Crafty Secrets stamps for the sentiment and stitching line. 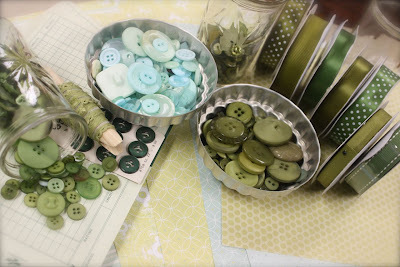 With all the crafty crazy going on, it's fun to reach for other types of crafting supplies....like the sewing themed stamps, old sewing patterns, my sewing machine, vintage buttons, etc. Oh how I love to dig through my goodies. Hope you're having a fabulous day! 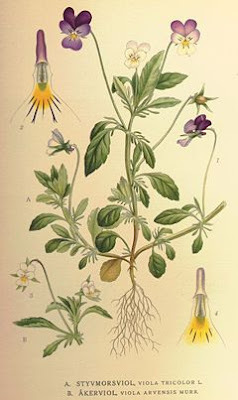 I love vintage botanical prints like the samples below. I have several pieces of framed artwork similar to these and they are some of my very favorites. I'll have to take a photo sometime. 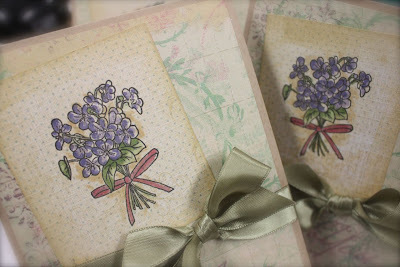 I was inspired to use JustRite's Breath of Spring stamp set, particularly the violets bouquet, to create some cards with this vintage, botanical feel. I stamped the floral image right onto some patterned paper. I love the subtle, polka dot background it instantly gives my images. Be sure to look for this type of paper when you're shopping, it's not just for backgrounds...stamp right on it and then color. These papers are from K and Company. Thank You sentiment is from Papertrey's Big and Bold Wishes stamp set. I love the E31 Copic marker that I used for outlining the image. Instead of a blue color, this tan color really ties in that vintage feel. I just love how soft and pretty these cards turned out. 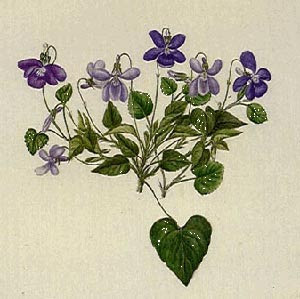 Tip: When coloring floral images, simply do an Internet search for the type of flower you're going to color. Then print it off to have a visual reference at your stamp area. It's a good thing. Labels: Collage Press, Copic, JustRite, K and Co.
Edit: Thanks for the Spring wishes everyone! It can't come soon enough, I think most of us are ready for some new weather. 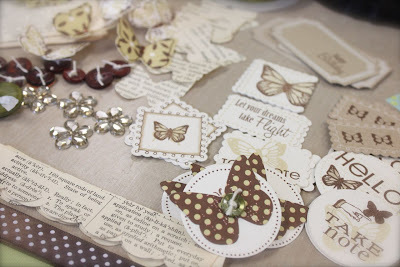 Many of you have been asking for more Butterfly Parcel kits, should I make a new batch???? Just leave a comment on this post. Also, new uploads to my Etsy Shop today, link on the left sidebar. Hope you're all having a great day. I'm digging into the freezer today to bake up one of my meals I made last week. Tonight it's Tater Tot Casserole. Even though I'm stuck inside sitting in my big comfy, green chair because the weather is still freezing....I'm longing to sit outside in my wicker chair and look at my pretty flowers, with the sun shining on my face. 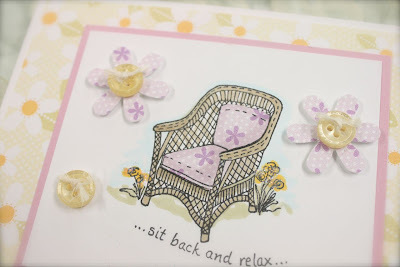 Karen Lockhart's wicker chair stamp makes me think of those fun times. I stamped the image and colored it with Copic markers. 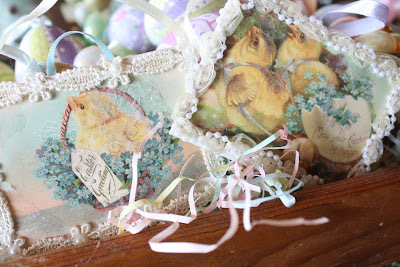 I paper pieced the purple cushions using Papertrey's Egg Hunt paper. 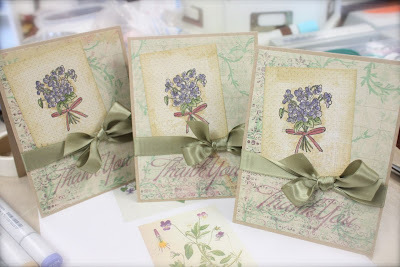 The punched flowers and background papers are also from the Egg Hunt collection. 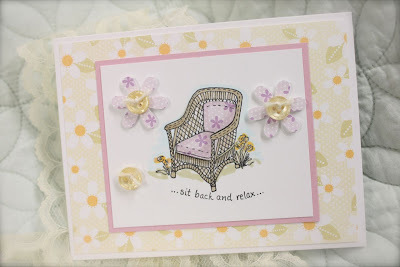 The *sit back and relax* sentiment is from Karen Lockhart's collection. So, are you longing to be outside with your flowers too? Somebody send me some sunshine and warm weather! Hi everyone, hope you all had a great weekend. I spent Saturday night home alone......just me, some snacks, a good pay per view movie (Couple's Retreat) and my stamps. 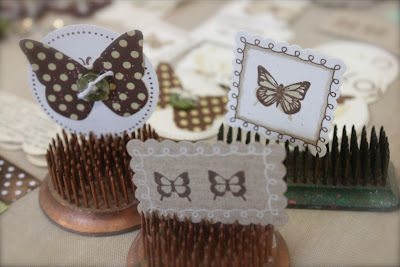 I kept my supplies pretty simple........Papertrey's Butterfly Dreams, Fillable Frames #1 and the matching dies. 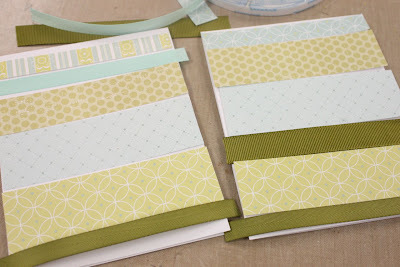 I did add in some border sets and punches too. Colors were Dark Chocolate and the Vintage Ink Duo cubes. Butterflies were definitely the theme. Once my movie started, I stamped.....and stamped some more.......I couldn't quit stamping. So...I watched the movie twice and kept on stamping. And then I got out the new PTI dies. 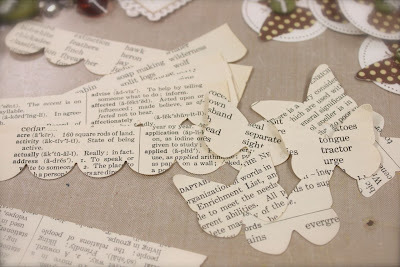 You can cut through at least 4 sheets of old text book pages with one cute. Like butter. Then I decided to make up a few kits with my butterfly doodads. I love the one that uses images from the Take Note set...the pointy finger with the resting butterfly. And the square one with the loopy square border from Borders and Corners: Squares....so botanical looking. I paired all the goodies up with some die cut scallop borders, a few Vintage Buttons, some ribbon and a few other goodies. 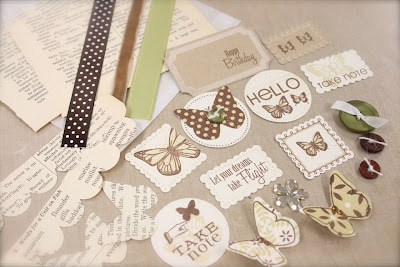 All this is in the Butterfly Parcel kit that will be up in my shop later this morning. 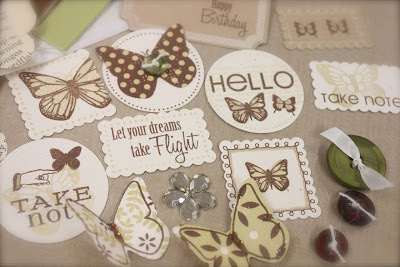 I used the negative cut butterfly images as tags for the Butterfly Parcel kits. Signed my name and attached to the glassine bags with some old string I got at a garage sale. The tags are tied on with PTI's new silk ribbon. Not trimmed neatly or anything. Recycle and reuse.....it's a great thing. The Butterfly Parcel kits are very limited in quantity and I won't have more anytime soon. Get 'em while they last, friends. :) Have a great day everyone!! St. Patrick's Day definitely makes me think green. 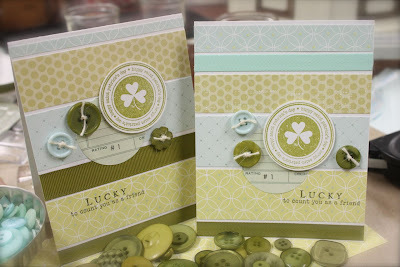 Nichole's new Papertrey set called Luck of the Irish was a requested set to fill some stamping needs. I think she did a great job and it will be fun to send some cards out this year. The cards you'll see today were in my PTI gallery on release night but I wanted to show you my process for making them. I created my cards using the same method that I used for my Valentine bookmarks shown in this post. 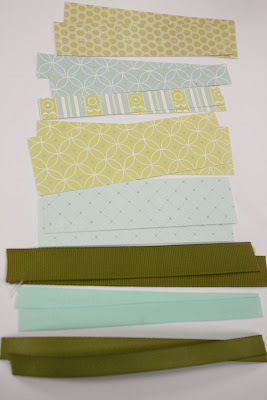 I cut strips of patterned papers from Pretty Pastels and the Everyday Blessings collection, and ribbons that would fit onto card fronts. Next, I adhered the papers and ribbon strips using adhesive and Scor-Tape for the ribbon. 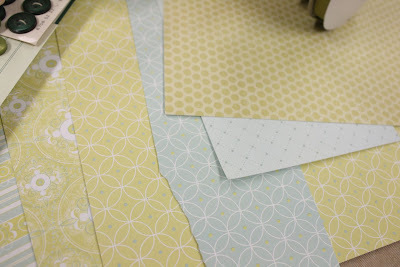 When everything is in place, turn the cards over and trim with scissors. Now I'm ready to decorate the card fronts. I used punched shapes from the Luck of the Irish stamp set along with a sentiment, tied Vintage Buttons and circles that I punched from old ledger sheets I got at an auction. The ledger sheets had the word *rating* on them so I punched out that word and added *#1* using Simple Alphabet. 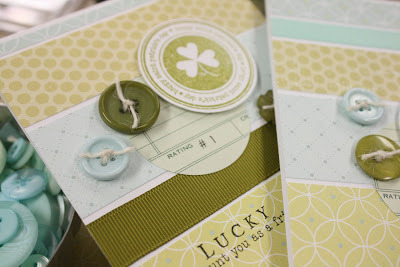 Lots of fun details for some fun St. Patrick's Day cards this year. 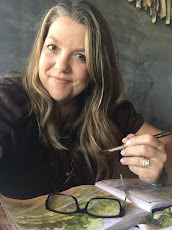 Edit: For my Australian reader who doesn't have tater tots......here is a link. Do you have hashbrowns? You could probably use those. If not, make homemade fried potatoes and put them on top before baking. Also, someone asked about my canned green beans. My mom helps me can them...we just stuff green beans into jars, add canning salt and water and pressure cook them so I don't have a recipe. Hey everyone, I actually got to feeling better yesterday so I did my meal planning day. This post will get long as I add in recipes, etc so settle in for a good read. Hey everyone, it's about that time again. Time for my 12 Days of Me Personal Day. You can read all about my 12 Days of Me concept and my January Personal day right here. I've chosen the 19th of every month to be my personal day. 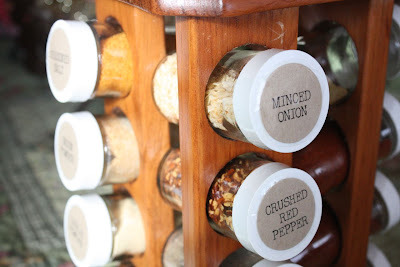 This month I am concentrating on meal planning and a little organization in my kitchen. I have all my groceries bought and stacked on my counter so I'm itching to get started. My meal planning will consist of a full day of cooking meals or partial meal items to have on hand. With all the girls' activities, my working from home and good tv on now at night (American Idol and Survivor), I don't want to spend anymore time in the kitchen at night than I have to. I LOVE to cook, don't get me wrong. But getting in and out of the kitchen at night means all that more time I have to relax and spend quality time with the family. With that said, I am not a huge fan of freezing meals. I tend to forget what's in the freezer and then I always think stuff tastes funny if it's been in there too long. So I'm planning a few casseroles, some pre-cooked meat, some cookies, etc that will provide a few week's worth of meals. Everything about this month's Personal Day will be added to this post. So it may get long but check back for updated recipes, photos and more. To pre-plan for my personal day, I started off by scouring my recipe books and the internet for tasty menu items. I made copies or bookmarked my recipe books with my final recipe choices. Next I made a huge grocery list of the items I needed for each recipe. The girls helped me shop this week for all of my grocery items. I made a trip to our local butcher shop for some meat too. It's thawing out so I will be ready to start cooking. I'll post more about my personal day later but in the meantime I wanted to show you some other stuff that's been cookin' in my kitchen. I am bound and determined to get this house of ours in order. I have taken after my mother and have become very good at *collecting* things. And those piles of *things* are now organized into what I call *organized clutter*. It's not good. It drives me nuts. I'm not as bad as those hoarder people on tv but there's a lot of room for improvement. So I've decided to tackle small areas, otherwise it gets overwhelming. Here's a project I did to spruce up a corner of my kitchen, one of my favorite rooms in the house because I dearly love to cook. 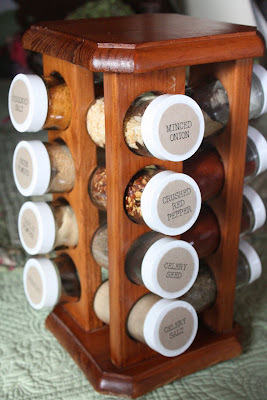 I had this spinning, wooden spice rack that we received as a wedding gift. I love to use it but over half of the spices in it were weird ones I never used and some had never been opened. Those spices were over 15 years old, eww. 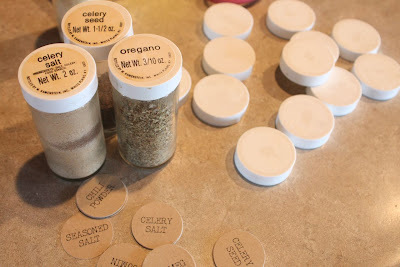 So I dumped out all the spices, washed the glass spice jars and soaked the lids to remove the old labels. New spices were added to the sparkling clean jars. I also made new labels for the lids using my computer and PTI Kraft cardstock. 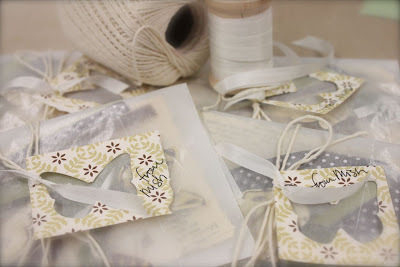 I punched out the circle labels and adhered them to the jars with clear packing tape. Fancy huh? I could have done some laminating or some other method but the packing tape worked for me. 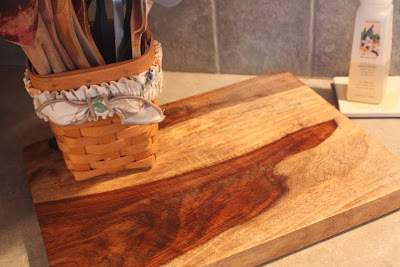 I cleaned up the wood spinner and gave it a coat of mineral oil just like I do my cutting boards. Spiffy! This is the corner of my kitchen that I cleaned up. I have been reading lots of articles on organizing and decorating and there is one phrase/rule that keeps sticking out in my mind. Here it is: Only keep the items you really love. Get rid of the rest. That's a pretty big statement for me because I've collected a lot of stuff over the years. I like my stuff. Stuff is good. But I applied my new rule to this corner. I got rid of a cutting board with a drawer that I really liked. Liked, not loved. Now I can honestly say that I LOVE, LOVE, LOVE everything in this corner of my kitchen. There's still lots of stuff, but it's the gooder stuff. I will never be a minimalist, let me just say that. I need my stuff sitting out. I'm probably more of a maximumist. Is that a word? More stuff is good. But I'm working on it. 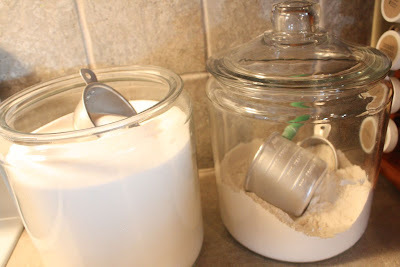 I even love the old tin measuring cups that are in my flour and sugar jars. Plain ol' cups wouldn't do, I had to find just what I loved. I love this new cutting board I got at Bed, Bath and Beyond. It's made from renewable tree source and has a very rustic wood pattern. I've searched for one like this for a long time. To spiffy it up, rub in mineral oil about every 30 uses. 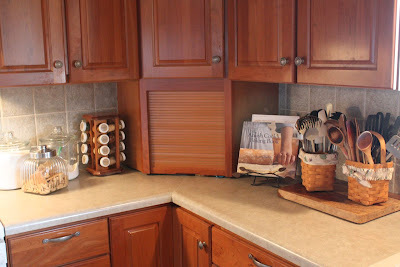 I also love my Longaberger baskets that hold my cooking utensils. Many of my utensils are from my days of being a Pampered Chef lady and some of the old wooden spoons are from my Grandma's stash. I also love Bath and Body foaming hand soap. And these items don't sit out but I love them so they're worth showing. 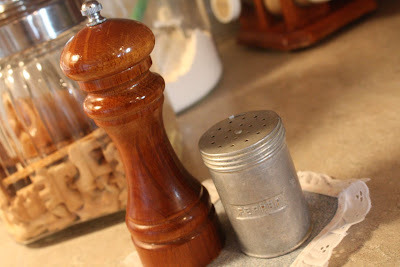 I love my pepper grinder, nothing compares to freshly ground pepper. Don't used the canned stuff. Sometimes I love it so much that I need mass quantities. So I take a bunch of peppercorns and grind them up in coffee grinder. I found this old tin pepper shaker at an antique store and knew just what I'd use it for. 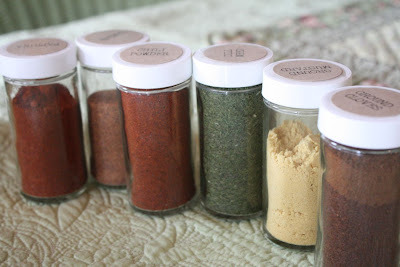 So now when I need a teaspoon or so of ground pepper for a recipe, I reach for my shaker. I only keep a quarter cup or so in there so it stays nice and fresh. So there you have it. I did it. I organized something. It feels good. What's next? 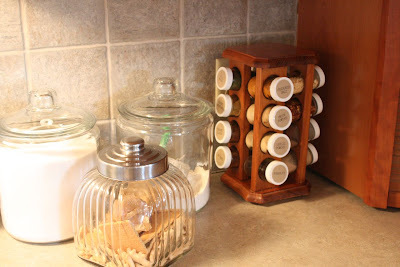 Get this, Becky Higgins showed a little part of her kitchen on her blog and she uses glass jars as canisters too. Love it! Restaurant Style Salsa from The Pioneer Woman.....link is HERE. Oh is this good. I've searched for a recipe like this that you can make with canned good. This is THE ONE. I'm going to can whole tomatoes this summer so I can use those. I'm making this to go with some of the Mexican food I'm making. Veggie and Cheese Bagel Sandwich from The Pioneer Woman....link is HERE. This is what I'll be making for my lunch on my personal day. I used to get these kinds of sandwiches with my girl coworkers when we lived in the city. Yum. Edit: I made this for lunch....so awesome!! In a 9 x 13 pan, layer 2 lbs seasoned, browned hamburger, chopped carrots, small chopped onion, 1 can whole corn, 1 can green beans (I used our home grown, canned variety). Mix 1 can Cream of Chicken Soup and 1 can Cream of Mushroom soup and 3/4 cup milk. Spread over veggies. Top with bag of tator tots. Bake 350 for 1 to 1-1/2 hours. This went into the freezer with the baking time and duration written on the foil with a Sharpie. Other recipes that I'm making are White Chicken Enchiladas, Three Cheese Stuffed Shells, and Chimichangas. I'll also be baking some chocolate chip/cream cheese cookie bars and browning up a bunch of ground beef to freeze for recipes. Good eats, indeed.